The Exontrol's eXSlider component allows you adding skinable sliders to your forms or dialogs. A "slider control" (also known as a trackbar) is a window containing a slider and optional tick marks. When the user moves the slider, using either the mouse or the direction keys, the control sends events to indicate the change. The volume controls in the Windows operating system are slider controls. The eXSlider component lets the user changes its visual appearance using skins, each one providing an additional visual experience that enhances viewing pleasure. Skins are relatively easy to build and put on any part of the control. The control is written from scratch as most of our controls, and it is not sub classing a slider or trackbar window class or similar, that's why it supports features never seen in other controls. eXGauge The eXGauge / eXLayers library provides graphics capabilities to visually display and edit the amount, level, or contents of something. The view can show one or more layers, where each layer can display one or more transparent pictures, HTML captions which can be clipped, moved, rotated or combination of them, by dragging the mouse, rolling the mouse wheel, or using the keyboard. 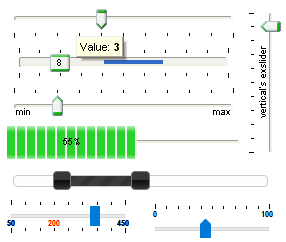 eXScrollBar The Exontrol's newly exScrollBar control simulates vertical or horizontal scroll bar, slider, track, volume or gauge controls.